This month the FCG Duty Managers have been brushing up on their environmental awareness reading, and are working their way through the Resource Efficient Scotland training course, which is available to everyone on the RES website. The course is the ideal way to train your staff in ways of improving the environmental impact of the office or organisation. It will help you to identify potential savings in your energy use, and highlights areas where you could make your office more resource efficient. The course is broken down into thirteen modules, each 15 minutes long, and the website also offers loads of free templates and documents to download and use. Each member of staff can sign up to the course and will receive a certificate with their name on it at the end, which they can proudly display in the office. 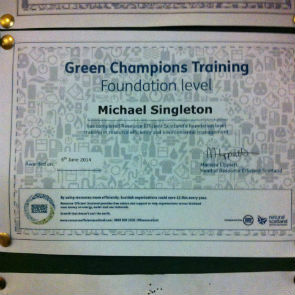 This will also make an excellent addition to any CV, will look great in the office and will highlight your commitment to reducing your environmental impact, as individuals, and as an organisation. If you would like to get started, you can visit the Resource Efficient Scotland Website (www.resourceefficientscotland.com), search for "Green Champion" and sign up for the course. Why not set an office incentive, and award a prize for the first person finished!